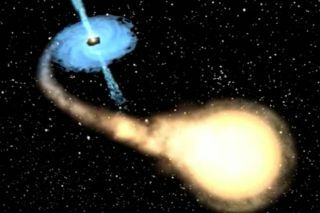 An artist’s illustration of a white dwarf (foreground) interacting with a black hole. A team of astronomers performed computer simulations to determine what happens when a burned-out stellar corpse known as a white dwarf passes close to an intermediate-mass black hole — one that harbors between 1,000 and 10,000 times the mass of Earth's sun. Such "tidal disruption events" (TDEs) can also generate gravitational waves, the ripples in space-time predicted by Albert Einstein a century ago and first detected directly in 2015 by the Laser Interferometer Gravitational-wave Observatory (LIGO). LIGO probably cannot pick up these particular gravitational waves, study team members said, but future instruments — such as the European Space Agency's Laser Interferometer Space Antenna, which is scheduled to launch in 2034 — may be able to do so. And huge amounts of material from extremely disrupted — that is, torn apart — white dwarfs can get sucked in by their killer black holes, sparking powerful radiation bursts that current telescopes are capable of detecting, according to the study. The new results suggest a possible way to get a better handle on medium-size black holes, which have proven surprisingly difficult to study. Astronomers have found plenty of small (stellar-mass) black holes, and supermassive black holes containing millions or billions of solar masses are known to lurk at the hearts of most, if not all, galaxies. But their intermediate cousins have remained elusive to date. "It is important to know how many intermediate mass black holes exist, as this will help answer the question of where supermassive black holes come from," study co-author Chris Fragile, a professor of physics and astronomy at the College of Charleston in South Carolina, said in a statement. "Finding intermediate mass black holes through tidal disruption events would be a tremendous advancement." Supermassive black holes aren't great disruptors, by the way; the behemoths are likely to gobble up a white dwarf before disrupting it appreciably, the researchers wrote. The new work is of more than just academic interest, for it describes a scenario that our own sun could end up enduring in the far future. Every star that begins its life with about 8 solar masses or fewer will end up as a superdense white dwarf. That fate awaits our sun in 5 billion years or so; after it exhausts its store of hydrogen fuel, it will bloat into a red giant and then collapse into a white dwarf. The new study has been accepted for publication in The Astrophysical Journal. You can read a copy of it for free at the online preprint site arxiv.org.